GDP at chained volume measure is a series of GDP statistics adjusted for the effect of inflation to give a measure of ‘real GDP’. Chained volume GDP statistics are calculated by measuring output using the price level of the preceding year and then linking the statistics to give a reflection of actual output changes and excluding any monetary (inflationary) change. e.g. if in a certain year, the price of cassettes increased 10% then this would have an increase in the CPI. However, if the price of cassettes increased 10%, but they were no longer produced in the next year, this increase in price wouldn’t affect the chained volume measure of GDP because if it is not produced, it wouldn’t be counted. The chained weighted measure gives the exact weighting of goods produced in that year. In other words, with a fixed weight method of calculating real GDP, the weighting of different goods can become outdated. A chain-weighted measure tries to avoid this by always measuring the output of the particular year. 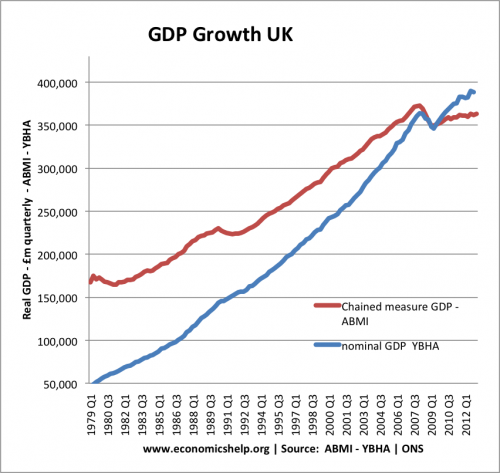 The UK Office for national statistics uses a chained weighted measure for calculating real (inflation-adjusted) measure of GDP. For A-level students, you don’t need to worry about these different ways of calculating real GDP. It is sufficient to know that real GDP takes into account inflation and measures actual output produced. Usually, there will not be a huge difference between the two ways of calculating real GDP anyway. Nominal GDP looks at raw market data. It doesn’t take into account inflation. This entry was posted in economics and tagged statistics. Bookmark the permalink. Thanks. Your explanation of the difference (between the CPI and FRED’s GDP Deflator) makes a lot of sense and improves my understanding. Here’s something. I’m pretty good at finding data at FRED. But I have no luck finding what I want at ONS. Do you have a post on that? Or some guidelines that might help me? Would be great!